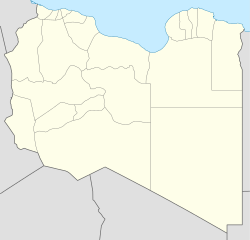 Nalut (sometimes Lalút) (Arabic: نالوت‎) is the capital of the Nalut District in Libya. Nalut lies approximately halfway between Tripoli and Ghadames, at the western end of the Nafusa Mountains coastal range, in the Tripolitania region. The town is a long-time Berber community and a cultural centre for them, with a festival held in Spring to revive and promote the local culture, traditions, industries and art of the Amazigh people. The name Nalut and its alternate Lalut may derive from the pagan Berber goddess of springs, Tala. As Nalut is only 60 km from the Tunisian border and lies close to some oases it played an important part in the caravan trade. Nalut is home to the Ksar Nalut ⵣⴰⵙⵔⵓ ⵏ ⵏⴰⵍⵓⵜ, which is a granary fortified by a ksour (castle). The facility has been abandoned but is a tourist destination. The fortress was a communal building where the local families could store their grain in times of conflict. The Alal'a Mosque – which is Nalut's oldest mosque – was rebuilt in 1312 CE. A monument to Muammar Gaddafi's Green Book in the town square was demolished during the Libyan Civil War. In late April 2011, "Radio Free Nalut" began broadcasting in the city. It was one of several rebel-controlled radio stations established during the civil war and conducted broadcasts in Berber. A national reconciliation conference for the factions in the Libyan Civil War was held in Nalut in September 2016. Nalut contains the Nalut Dinosaur Museum, which exhibits fossil trees, crocodiles and dinosaurs which have been discovered in the vicinity of the town since the first find in 1998. ^ "Nalut, Libya". Wolfram Alpha LLC. ^ "Nālūt". World Gazetteer. Archived from the original on 2012-12-08. ^ "Nalut, Libya Page". Falling Rain Genomics, Inc.
^ "اللجنة الشعبية العامة" [Sha'biyat of Great Jamahiriya] (in Arabic). Archived from the original on 7 February 2009. ^ a b c d "Dinosaurs and ancient beliefs: Life in Libya's highlands". Middle East Eye. Retrieved 2016-11-24. ^ a b "Nalut". Temehu.com. Retrieved 2016-11-24. ^ "Nalut City in Libya". Mygola. Retrieved 2016-11-24. ^ Peterson, Scott (28 April 2011). "Freedom now rings from one mountaintop radio station in western Libya". The Christian Science Monitor. Archived from the original on 2 May 2011. ^ "National reconciliation conference to be held in Nalut". Libya Herald. Retrieved 2016-11-24. Wikimedia Commons has media related to Nalut. This page was last edited on 29 July 2018, at 20:00 (UTC).